"The Albany" redirects here. For the theatre in Deptford, see The Albany Theatre. For other uses, see Albany (disambiguation). ^ Historic England. "ALBANY COURTYARD, City of Westminster (1209755)". National Heritage List for England. Retrieved 2017-12-15. 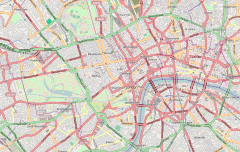 Wikimedia Commons has media related to Albany, London. This page was last edited on 25 February 2019, at 21:58 (UTC).